We've long noted the role of Cyprus as a dirty haven for crooked money from the former Soviet Union (particularly Russia,) where it can be washed before entering the City of London and other unsavoury parts of the global financial system. Now here's an interesting post from the trader site Testosterone Pit, with some interesting insights. First, as we know, Cyprus is bankrupt. "The Republic of Cyprus, with its 840,000 people, has been in the Eurozone for less than five years. It and its banks burned through mountains of euros faster than anyone could count. Now they need a bailout whose magnitude balloons every time someone blinks." The Greek situation on its doorstep hasn't helped, of course. But the curious fact about is that Russia has provided bailout money. Russia? Well, yes. It turns out that Cyprus has been the largest foreign investor in Russia by a country mile (rather in the same way that the British Virgin Islands has been the largest investor in China, after Hong Kong): $41.7 billion was invested in Russia from Cyprus in 2007-10, nearly three times more than German investments in Russia over that time period. "In the last three months of 2011 alone, $37.4 billion left Russia, which analysts put down to Russian banks that have increased their lending to the subsidiaries of Russian companies based in tax havens." "It wasn’t Cypriot money flowing into Russia. It was Russian money flowing back. 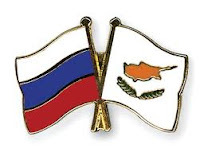 Russian companies have long established their headquarters in Cyprus to benefit from its status as a tax haven, a trend that picked up when Cyprus acceded to the EU and then the Eurozone." Hubert Faustmann, professor of history and international relations at Nicosia University, sheds some more light on the Russian question. "The Russian business elite are using Cyprus extensively for financial transactions and as a tax haven and they surely do not want to lose those facets," he says. "A lot of Russian cash is invested in Cyprus and then goes back to Russia." He says this has the effect of making Cyprus, on paper, one of the largest investors in Russia worldwide." But there is one thing that seems to be going for Cyprus' national balance sheet. They have discovered a lot of natural gas. Eight trillion cubic feet of it, which (if this estimate holds up, which it may not) is a whole lot of gas. P.S. The New York Times seems to have mostly missed the story. Uncounted - is tax justice 'too political'?